Optimum Nutrition Amino Energy is one of the most popular BCAA Drinks on the market. The supplement has multiple purposes when compared to other amino drinks. As ON amino energy is sugar-free and contains a green tea matrix, it can be consumed in the morning, pre workout, intra workout or even post workout. WHAT’S IN OPTIMUM NUTRITION’S AMINO ENERGY DRINK? Each serving of Amino Energy contains 17 separate ingredients per two scoops. The primary component of Amino Energy is the Amino Blend which comprises 5 grams per serving (serving size is two scoops). In this 5 gram component, there are 14 separate ingredients. This goes beyond the standard BCAA to include even non-essential amino acids and beta-alanine. WHAT DOES OPTIMUM NUTRITION AMINO ENERGY DO? Optimum Nutrition Amino Energy always gives you the edge. It’s been specially formulated with 100 mg of caffeine, including green tea and green coffee extracts. Each great tasting drink is also packed with 5 g of micronised amino acids, including BCAAs. Delicious, sugar free and just 29 calories per serving! WHEN IS THE BEST TIME TO USE AMINO ENERGY? For a more intense burst of energy before the gym, the Gold Standard Optimum Nutrition Pre Workout might be a more suited pre-workout supplement for the more advanced gym goer. WHAT INGREDIENTS ARE IN AMINO ENERGY? Citric Acid, Malic Acid, Natural & Artificial Flavors, Inulin, Beet Color, Tartaric Acid, Silicon Dioxide, Calcium Silicate, Gum Blend (Cellulose Gum, Xanthan Gum, Carrageenan), Sucralose, Lecithin, FD&C Yellow #5 & 6. Buy Optimum Nutrition from HPnutrition.ie, Ireland's Largest Online Sports Nutrition & Health Store. Adapt Nutrition Pre TrainFor the days wh..
Kinetica Pre Fuel Pre Workout - 300g 40% Off. 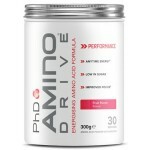 Kinetica Pre Fuel Pre Workout - 300g ..
PhD Amino Drive Key Benefits100mg c..